British professors say that many of their student struggle to read assigned books from cover to cover, a problem that the students attribute to the lack of time they’re given to complete those texts. 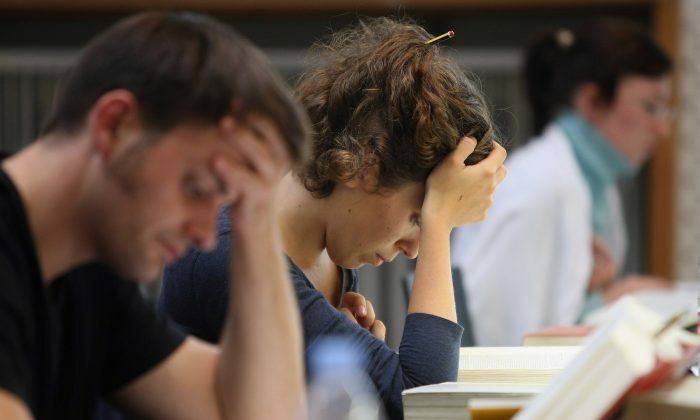 The conversation was sparked by professors who said that many students nowadays find finishing books “daunting” and blamed it on their short attention spans. “Students struggle with set texts, saying the language or concepts are too hard,” said Jenny Pickerill, a professor in environmental geography at the University of Sheffield, according to the Independent. There is currently a disjuncture between the types of reading we want students to engage with and the types students feel able or willing to do. The charges of laziness have been brushed off by the students themselves, who say that they’re not given enough time to complete the required texts, and that how students are tested discourages them from completing the books. “It’s just not true that students find reading whole books too challenging. The reason some students don’t read whole books isn’t because they struggle to, but because of problems with how we’re assessed, and the over-emphasis universities place on assessment,” said Minesh Parekh, Education Officer at the University of Sheffield Students’ Union. Do you finish a book that you probably won’t write your essay on, or do you complete the seminar work that’s due in for the next day? I know what I’d rather choose. Some students pleaded that the curriculum be reformed to give students more time to read the assigned books, which they say would allow them to actually digest the material. An undergraduate course at University of Sheffield English Department typically has a reading list of 20 to 30 books, and a number of students said that it was unlikely for them to finish a book before deadline because they needed to budget their time.